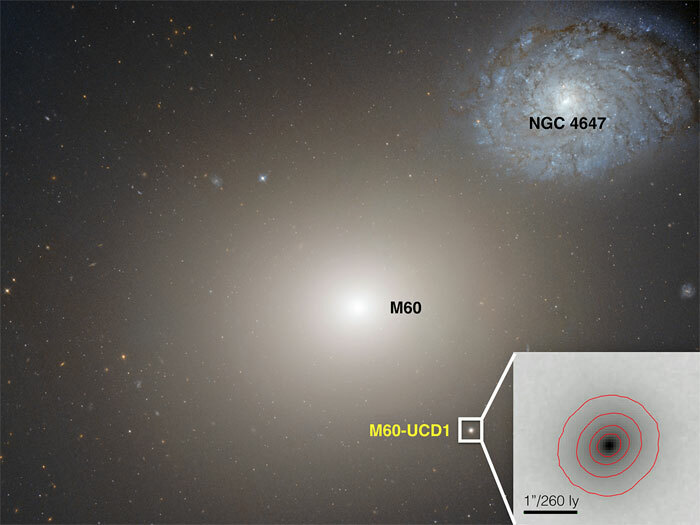 A team of researchers, including an MSU astronomer, has discovered a black hole at the center of an ultra-dense galaxy known as M60-UCD1. This Hubble Space Telescope image compares the size of that galaxy to the gigantic NGC 4647 galaxy. A team of researchers, including an astronomer from Michigan State University, has discovered a huge black hole at the center of an ultra-compact galaxy – the smallest galaxy known to contain one. The galaxy, known as M60-UCD1, was discovered last year by a team led by Jay Strader, MSU assistant professor of physics and astronomy. Strader was a member of the team that found the black hole. The findings are detailed in the recent edition of the journal Nature. The finding suggests that other ultra-compact galaxies also may contain massive black holes. And that those galaxies may be the stripped remnants of larger galaxies that were torn apart during collisions with other galaxies. There has been much debate whether ultra-compact dwarf galaxies are born as jam-packed star clusters or if they are galaxies that get smaller because they have stars ripped away from them. The discovery of this black hole, combined with the high galaxy mass and sun-like levels of elements found in the stars, favor the latter idea, Strader said. The supermassive black hole found at the center of this galaxy is estimated to have a mass of 21 million suns. By comparison, the mass of the black hole found at the center of our Milky Way galaxy is only about 4 million suns. The other interesting aspect of this finding, Strader said, is that it suggests supermassive black holes are more common in less-massive galaxies than previously thought. "This means that the ‘seeds’ of supermassive black holes are more likely to be something that occurred commonly in the early universe," he said. However, it does continue to be a matter of debate as to whether these black holes could instead have come about as a result of unusual "seeds," such as "super" stars that collapse directly to massive black holes, or runaway stellar collisions that occurred in the core of a dense star cluster. The research was funded by the National Science Foundation, the German Research Foundation and the Gemini Telescope partnership, which includes the NSF and scientific agencies in Canada, Chile, Australia, Brazil and Argentina.